Carlton Massey (January 17, 1930 – May 22, 1989) was a professional American football defensive lineman who played in the National Football League (NFL) for the Cleveland Browns (1954–1956) and Green Bay Packers (1957–1958). He attended Southwestern University and the University of Texas. He was drafted by the Browns in the eighth round (95th overall) of the 1953 NFL draft and participated in the 1955 Pro Bowl. He wore the number 82 with the Browns and the number 81 with the Packers. 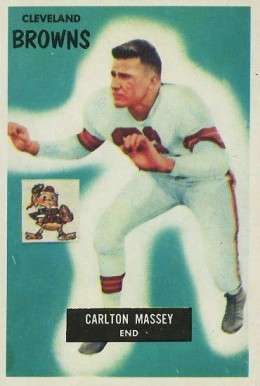 Massey played a total of 49 games in his five NFL seasons. He had one interception in his career that was returned 24 yards. ↑ "Carlton Massey Statistics". Pro-football-reference.com. Retrieved 2010-11-21.